Roberto's Account of the Mt. Scenery stairway. 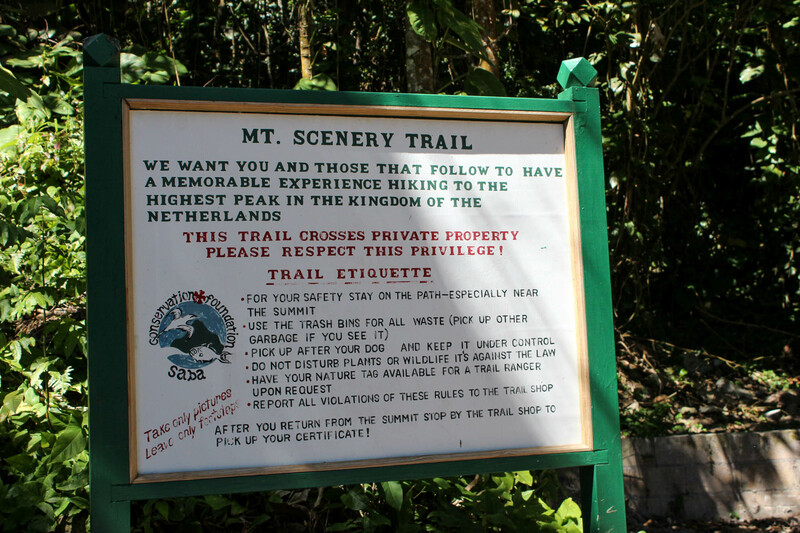 Rising 2,855 feet above sea level, Mount Scenery is the highest point in the Netherlands. An impressive feat when you consider that it is almost half a world away from the continental Netherlands. 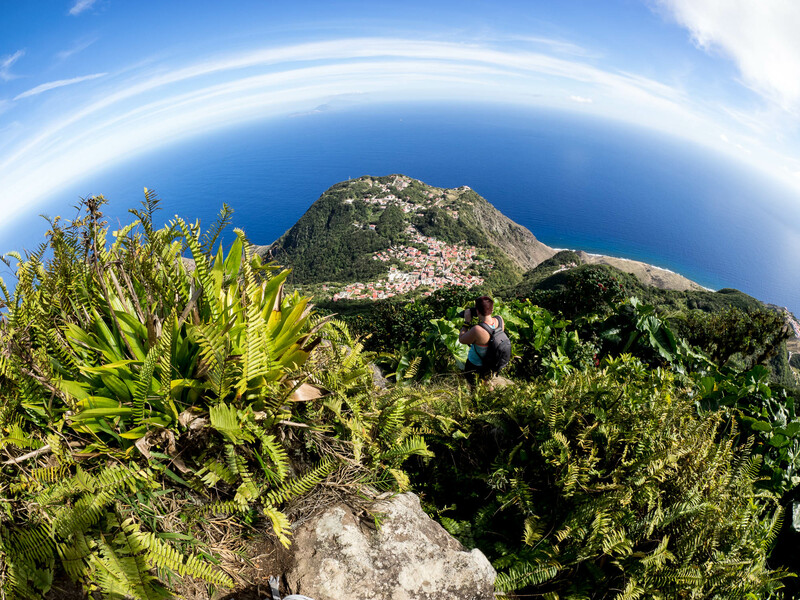 The name is appropriate since not only is the view from the summit spectacular but the entire mountain makes up the majority of the land mass on the island of Saba itself and as we discussed in an earlier article, Saba is beautiful. Views of the mountain greeted us every morning from our room at the bed & breakfast and some portion of the mountain is visible almost everywhere on the island – just look up. Now, when you’re a casual hiker (read: not all that much into hiking) and you’re engaged to an avid hiker, you accept that there will inevitably be hiking in your life from here on out and you’ve made peace with that fact (the sort of Israeli/Palestinian peace that feels like it needs to be renegotiated every time the topic comes up). So when we planned our trip to Saba and saw it was a great destination for hiking I didn’t really complain all that much – in fact I even looked forward to it. 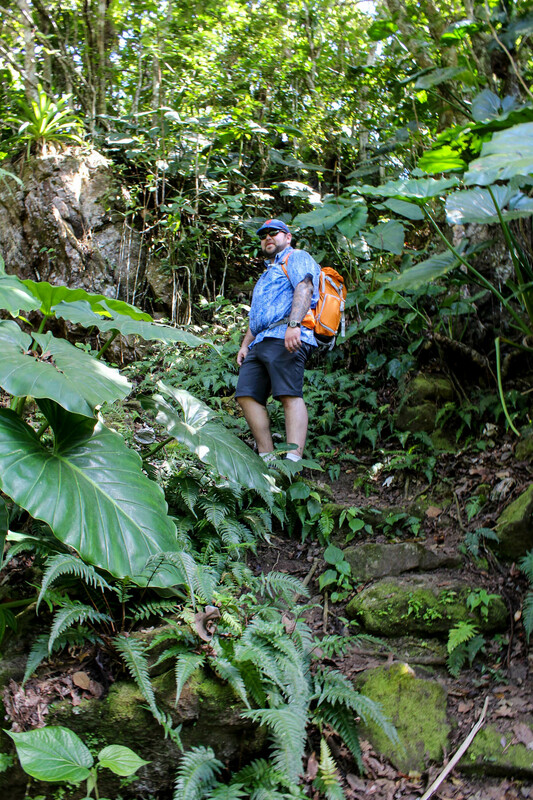 That enthusiasm for hiking on Saba endured all the way up to the point where I was roughly 1/4 mile up the trail. Mt. Scenery is somewhat unique in that the trail to the summit actually consists almost entirely of a man-made stairway. 1,064 stairs to be exact. While I wouldn’t go so far as to say that stairs are my enemy, we have never really been close friends – like distant Facebook friends, I sometimes check their profile to remind myself what a jerk they are. But when we set out to accomplish the hike to the summit, stairs didn’t actually soundbad at first. Surely they were installed to make the hike easier and safer for visitors. How bad could they be? Well by the time I reached the summit I decided that the stairs, although probably easier than the alternative, were pretty bad. It became quickly apparent when we started this hike that I was going to be left behind. Nicole decided she didn’t want to deal with any complaints that day so she went on ahead and I didn’t see her again until I reached the top to find her casually awaiting my arrival. The trail map you can get in the Saba Trail Shop is very accurate so you can track your progress by the landmarks you encounter along the way (bends in the path as well as small structures that were assembled to provide shelter from the rain). There were times during my ascent that I forgot to check the map for awhile and upon cresting the top of a particularly vicious section of the stairs that could only be the final section to the summit I discovered how very wrong I was. The stairs combined with the tropical heatproved to be quite difficult. 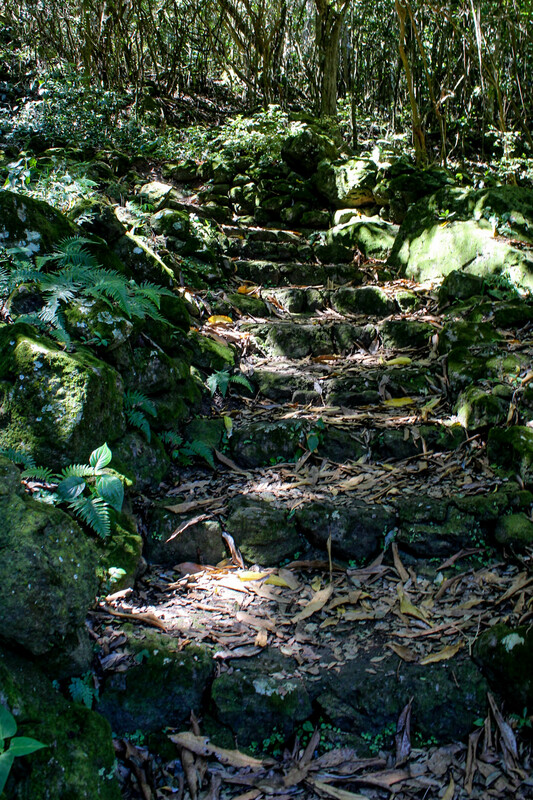 At first it doesn’t seem so bad, but after awhile the stairs get a little steeper, then a little steeper and much less uniform, until by the time you’re close to the top you feel like Frodo Baggins, resigned to an honorable death, clawing your way to the top of the fiery hell of Mount Doom. About 3/4 of the way to the summit I found some lovely benches in the shade that had been provided for hikers and I took full advantage of them for a nice break and a snack. It was then that I got mugged. It turns out that the shady benches are nothing more than a trap for unsuspecting hikers. As I opened a delicious and protein packed granola bar Inoticed several native chickens emerge from the undergrowth around the bench, I was clearly on their turf and they were demanding I pay the toll. At this point I was starving, hot, sweaty, and exhausted so I happily broke off a small piece of my granola bar for the “cute” native chickens. They sensed weakness. As I went to take a human sized bite for myself one of the chickens launched herself at me, claws extended like a Jurassic Park raptor, causing me to drop a huge chunk of granola bar in the dirt and stuff the rest in my mouth as I fled for my life. There was nothing to do but continue my climb, unsatisfied by my snack break. Clever girl. I eventually reached the summit. 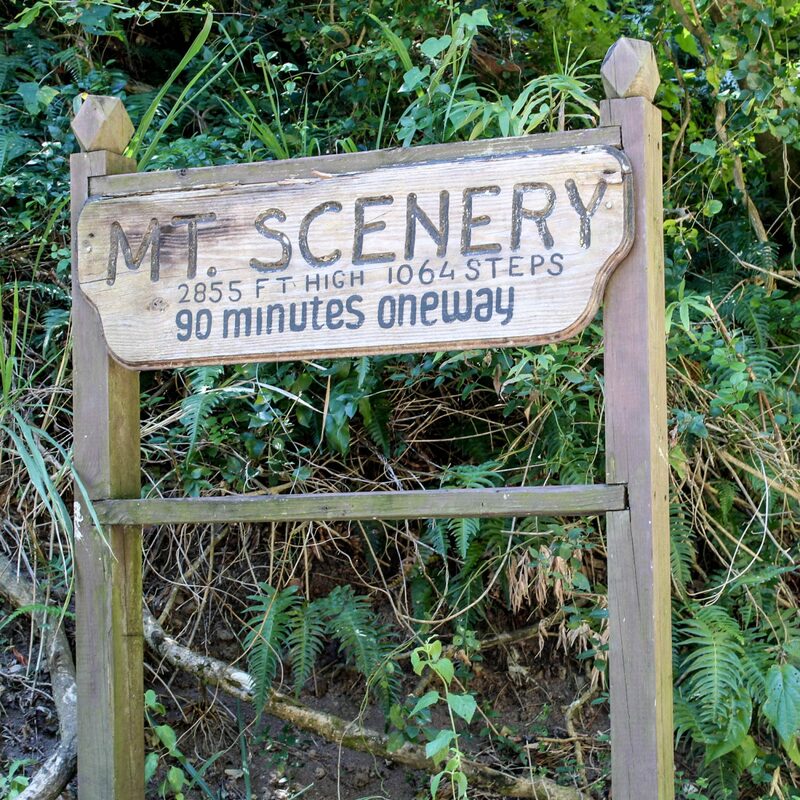 I don’t remember much of the last section of the ascent other than it being strenuous and increasingly muddy, I may have blacked out from exhaustion as I walked. But I remember finally getting to the top to find Nicole casually sitting beside the path waiting for me. Being too tired to swear or complain I caught mybreath, had some water, and told her about the chicken attack. Her uncontrolled laughter was not exactly the sympathetic reaction I desired. We spent the next hour or so exploring the two scenic viewpoints on the top of Mount Scenery. The hike up may have been difficult but the views were stunning. 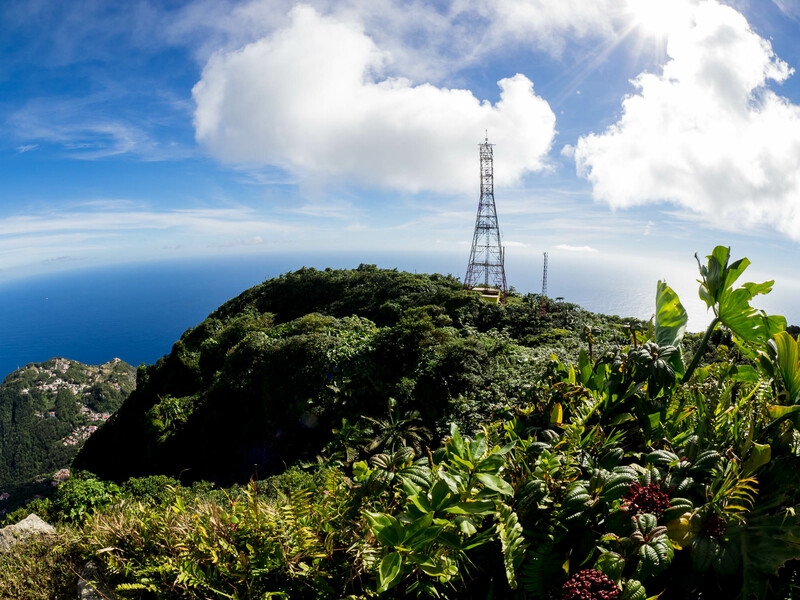 The air at the top was crystal clear, allowing us to see every nearby Caribbean island as well as the village of Windwardside at the base of the mountain. The mud at the summit was unexpected and we each came close to losing shoes to the muck – something to keep in mind: when you think you’re done with the hard part, there’s mud. The trip back down the mountain staircase was much less eventful, although the stairs are still a challenge. If you have any type of joint difficulty, particularly with your knees, I recommend a walking stick. On the way down, I ended up leading the walk as I was eager to return to the town to find a meal (being unwilling to try another granola bar for fear of attack). I had to wait for Nicole at several points while she stopped to photograph some of Saba’s natural beauty and local wildlife. It’s probably how she feels waiting for me in a crowded city while I photograph people on the street or random bicycles. Eventually we made it back to our home base in Windwardside, enjoying a hearty dinner at one of the many delicious restaurants in the town. We elected to eat outside since by the time we got there we were pretty disgusting. Ultimately, the hike up Mount Scenery was absolutely worth it. The views were amazing and the wildlife you’ll encounter in the rain forest on the way up is great (apart from the chickens). It was my first real hike in a tropical climate and it’s safe to say I was somewhat unprepared. So be sure to plan ahead of time, pack plenty of water and a walking stick and of course extra snacks for the chicken toll. The sun wasn’t bad on theway up when you’re in the rainforest but it can be pretty brutal at the top. A good pair of shoes or boots is a must. I’m glad I got to experience the mountain, and someday I may even do it again. One thing is for certain, if you make a habit out of hiking Mount Scenery, you will never need a gym membership.